How about earning airtime recharge to you phone on a daily, weekly and monthly basis by completing simple tasks? I know you might be wondering how!?. Well, it is very possible with the Geopoll app. Take short, easy surveys and earn airtime credit from GeoPoll. You can also create free polls for the community to participate in. 1. look closely at or examine (someone or something). 2. a general view, examination, or description of someone or something. 3. examine and record the area and features of (an area of land) so as to construct a map, plan, or description. GeoPoll is a mobile surveying platform revolutionizing the way data is collected. They conduct surveys through the mobile phone to help share your voice and opinions with the world. All GeoPoll messages are free to you and delivered by a zero-rated shortcode and on the app. GeoPoll takes privacy very seriously. They will never ask you for your name or other identifying information and all responses are anonymous. GeoPoll will never share your phone number with anyone else, including their partners. Your survey responses are stored with a randomized unique identifying number and not with your phone number. Geopoll is quite real, as it is a well know international survey company. The work with so many companies, organizations, countries to bring them people's opinion about their services or anything at all. It help enhance their service by knowing what people think about, how they relate with their products and services. 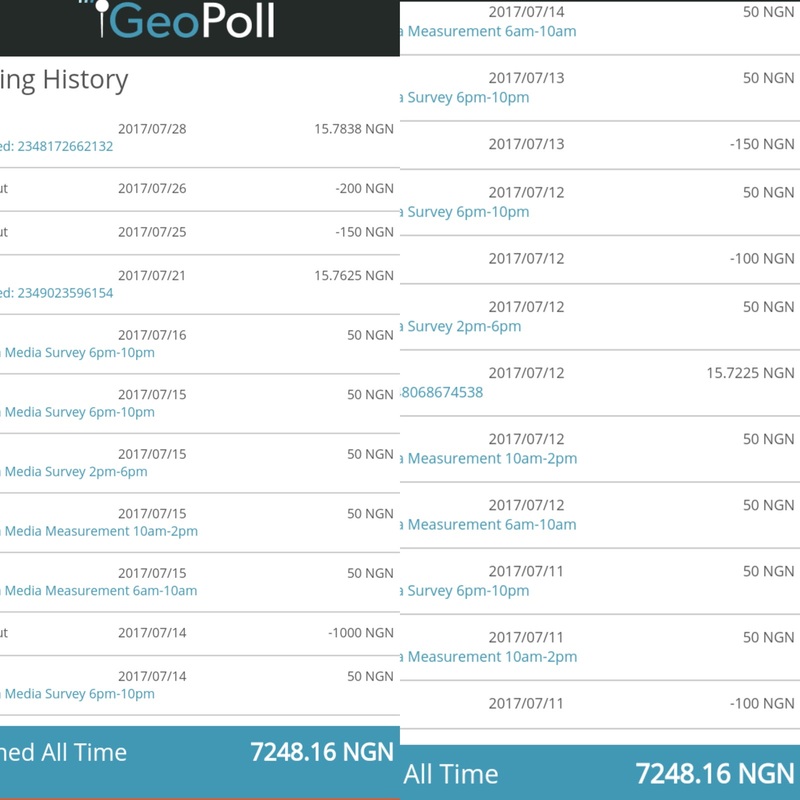 I have been using geopoll for about 4 Months now, I have earned alot so far from the surveys I answered. NOTE: Geopoll does not and will never request for your credit card details, bank details, money for upgrade etc..
Click here to download the app from playstore and register for GeoPoll surveys on the app using referral code XHOQXAZ to get first 3 surveys immediately or register on the site here using referral code XHOQXAZ . You’ll get a message to verify your number. GeoPoll randomly selects users to receive short surveys. Most surveys take less than 10 minutes to complete. Once you have completed a GeoPoll survey you will receive airtime credit deposited into your account. Surveys allows you to earn airtime by answering short questions about the world around you. Earn more than N100 airtime about twice a day by answering questions on what you are watching or listening to on TV and radio. Following set instructions, take pictures using your phone and earn airtime worth between N250 to N600 per task. Earn airtime by giving feedback on selected apps. 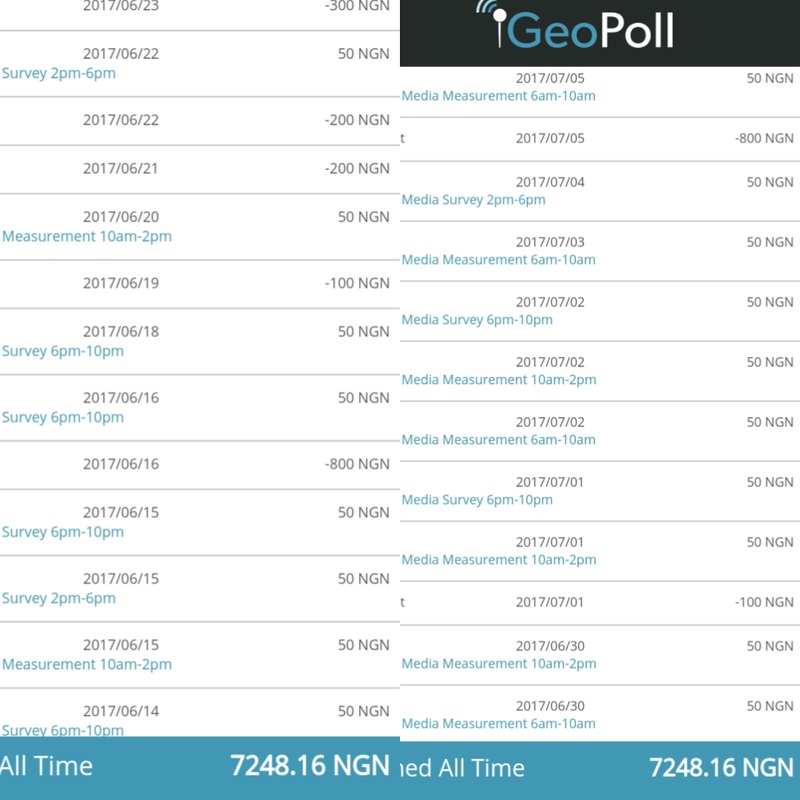 Earn airtime by taking part in GeoPoll’s surveys. You can answer as many surveys as there are as you wish. 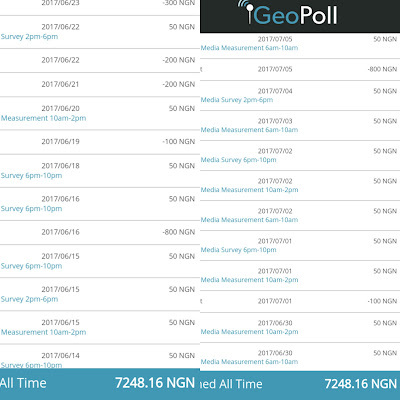 Community Polls allows you to create surveys (get your questions across to the world at no cost at all) and explore results using our platform - it’s FREE!. When will my airtime credit get delivered? GeoPoll delivers airtime credits to pre-paid accounts within 48 hours of completing a survey. You will only receive airtime credit if you have answered all survey questions. The amount may change for each survey and will be detailed in the first GeoPoll message. What if I don’t want to receive GeoPoll messages anymore? GeoPoll works with brands and organizations worldwide to help them make decisions to better serve you and your community. How many surveys per day? Hello, it's not so much an issue if the padsipa is there.. Which is the best solution to me?